Shirts With Random Triangles: Kevin Sumlin was ringside at UFC 162 with Usher. It looks like Johnny Manziel isn't the only person at Texas A&M that gets prime seats at sporing events or hobnobs with music royalty. Aggies' head football coach Kevin Sumlin did both Saturday night as he was seated at ringside next to Usher at Saturday night's UFC 162 in Las Vegas. 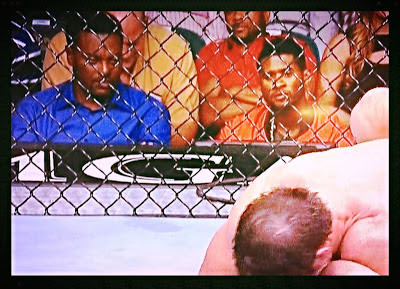 Sumlin and Usher got to witness up close as Chris Weidman shocked the world by defeating Anderson Silva to gain the UFC middleweight championship. What Manziel, Lil' Jon, and Ludacris were up to last night is unknown.